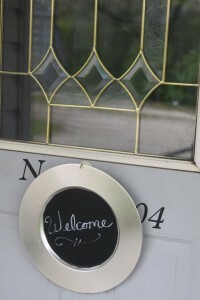 A can of chalkboard spray paint and an unused platter turn into a simple and useful welcome sign f or your home. A delightful little chalkboard that can welcome guests, politely ask them to remove shoes, or greet your friends for a party. 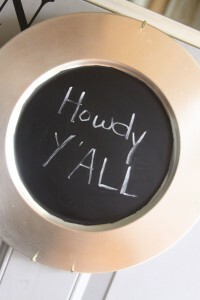 I have always loved the possibility that chalkboard paint gives you, but I really love the idea of it in a spray form! I picked up a can of Krylon chalkboard spray paint for a project and am positive I will never go back to the can and paintbrush method. It goes on so smoothly, and quickly with no mess and no clean up. With just one little can of paint I have already done three projects, with paint leftover for more. This is one of those projects that I started just because i had everything on hand and was looking for a good way to use a pretty plaque that I had. All I needed was my can of chalkboard spray paint, painters tape, an unused plaque or plate, plate hanger, and chalk for the finished project. I used a decorative plate that I already had, but I’m sure you could find an array of these to choose from at goodwill if you don’t have one. You could use a serving charger, platter, plaque, or regular plate. 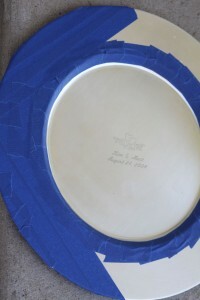 I used small pieces of painters tape to make a circle around the outside of the plate. I wanted just the center of the plate to be a chalkboard so I did the best I could to create a neat little circle using the small sections of tape, and then covered the rest of the outer edge of the plate as well. 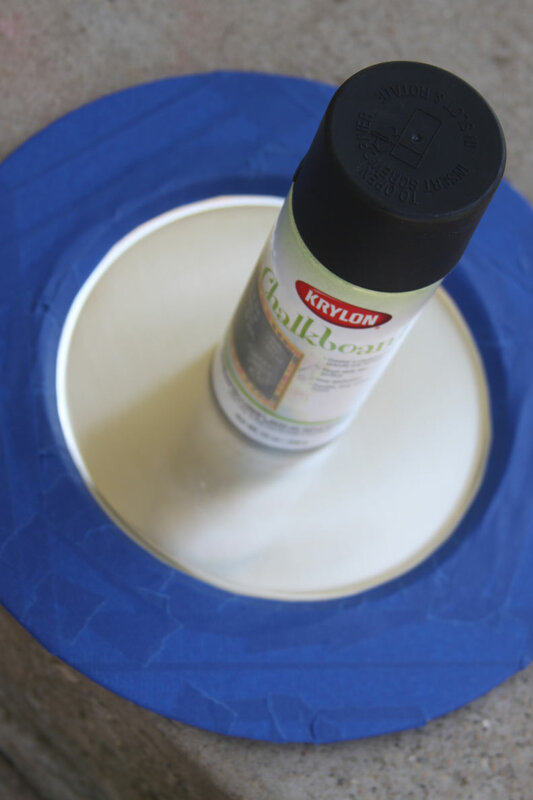 If you are using chalkboard paint that you apply with a brush it wouldn’t be necessary to tape off the whole outside of the plate, but with the spray version it certainly is. Once my circle was all taped off I added two thin layers, one after the other was dry, of chalkboard paint. This step took me all of about 5 minutes with my handy spray paint and the finished product was so smooth and very neatly done. I waited until the paint was dry and carefully removed the painters tape, which easily peeled off of the plaque. 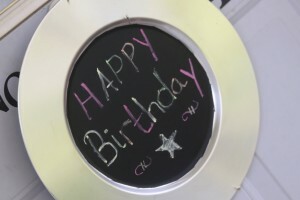 I added a dollar store plate hanger to the back and had an instant decorative chalk message board for our front door. This would look great anywhere in the house, but I chose the front door for a few reasons. 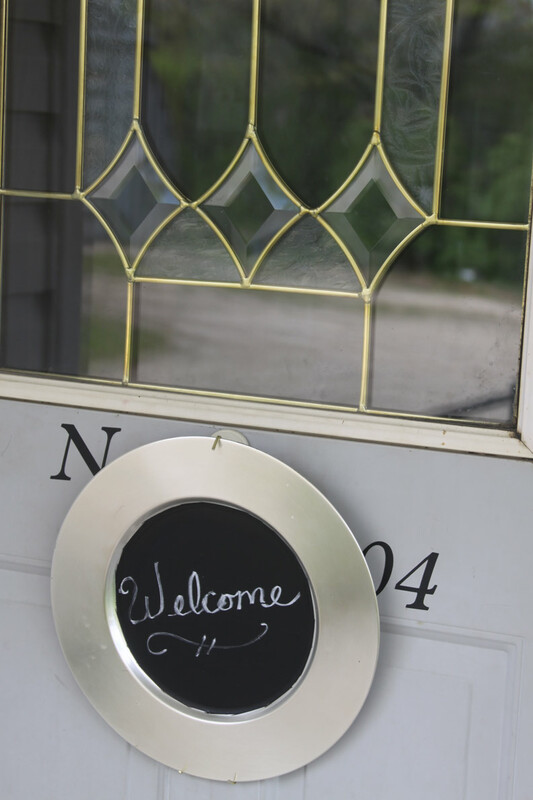 It is a great way to welcome guests with a simple message and a polite way to ask them to do things like remove their shoes or refrain from knocking. This is one of those things that I really wish that I had thought of when my kids where babies, but am happy to share with those that could use the idea right now! My first baby was a horrible sleeper, and was cranky, and fussy most of the time. When he was actually sleeping it was a really, really big deal, and the idea of a sleeping baby woke by an unexpected door knock made me nutty. Probably because I hadn’t slept in good year or so too! Remember that scene from Marley and Me, where the baby is sleeping, and she plops on the bed for a moment of peace, just to be sprung out of bed when the dog barks and sends the baby into a screaming fit? That was my first two years after my son was born. This chalkboard plaque would have made the perfect front door greeting for our home through those sleepless years. Just a kind reminder to visitors, or delivery people to aid in the peace of a sleeping baby. Don’t judge me! I know some of you think it is best to make all the noise you can, and not change things for baby and I don’t necessarily disagree. But, if you had or have, a very fussy baby you know what I’m talking about. My second baby was a breeze, and I never would have thought this necessary for her, but it’s a great tool for babies who really need the extra rest. Now that we are past that stage and onto another, this simple plaque can help remind guests to remove their shoes before entering the house. Where we live there is a gravel driveway and it is next to impossible not to track mud and dirt into our house especially during the winter and wet spring months. You know a five and three year old don’t think about what might be on the floor as they drive their cars on it, lay in forts on it, or snuggle up wit their favorite blankies on it. Our floor is their playground and I always do my best to keep it clean because I know their little hands, and everything else will be touching it. I love the saying “Since little fingers touch our floor, please remove your shoes at the door.” What a cute way to ask your friends and family to take their shoes off for your kids sake. This is a great idea if you have an infant that is crawling or rolling, or toddler learning to walk. I think this would make a great baby shower gift for new parents to hang on their door! A new baby transform a home into grand central station and this would be a great way to advise visitors. They can either write instructional messages like these or let friends and family know that visitors are welcome! On the lighter side this is a great way to welcome guests with quirky messages or well wishes. Now that the kids are getting older, and have pretty much wrecked the carpets anyways, we aren’t too fussy about people removing shoes or not knocking on the door during nap time. I love using this plaque as way to help celebrate a special occasion like a birthday, or even a simple visit from the Grandparents. I sometimes even let the kids write a message or decorate it if we know visitors are coming. I am really enjoying our chalkboard message plaque on our front door, and enjoy the versatility it gives me in greeting people! The best part of this project was that I had everything that I needed to make it on hand and it didn’t cost a cent. I even found a way to use something that we had that wasn’t being used at all, my kind of DIY project! This would be a great and inexpensive DIY gift to give for any occasion too. Weddings, bridal showers, baby showers, housewarmings, birthdays, mother’s Day, anniversaries, anything!